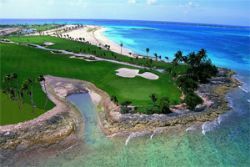 Located on Paradise Island’s north shore, this resort is nestled within 35 tropical acres less than one mile from the Ocean Club Golf Course. Its 106 rooms include 16 suites and three villas. Each room is richly decorated and includes a private balcony or terrace. Legendary in its reputation for entertaining the world’s elite, the resort features residential-style villas ideal for families, world-class golf, tennis, spa indulgences, water activities and more. The Clubhouse – casual light meals; Dune – French/Asian fusion cuisine; The Library – tea, pastries, and bar service. Activities, Adult’s Pool, Bike Rentals Available (Complimentary), Fishing (Deep Sea), Golf, Non-Motorized Water Sports, Scuba Diving, Snorkeling, Tennis Court. Casinos, Snorkeling Lagoon, Water Park, Marine Exhibits, Golf.